Branding your DonorPerfect Online Forms builds trust and increases the probability that supporters complete their donation, sign up for membership or volunteer. 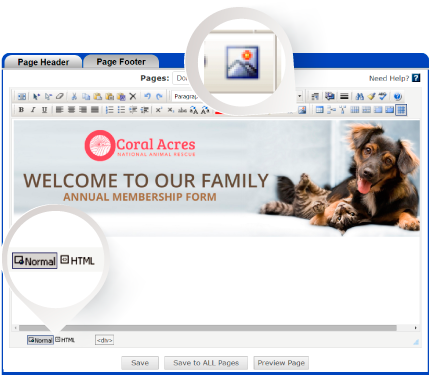 Start by adding your logo, address and other important information to the header and footer of the form. Next, use the Form Styler® to easily set the colors and fonts to your organization’s brand. Finally, create a link for sharing on your website, in email messages and on social media. To begin editing your form, simply click the edit icon next to your form. Then select Edit Header/Footer from The Basics menu. Edit your form and click The Basics and select Edit Header/Footer. Click on the Page Header tab to edit text and insert/upload images. You can also click the HTML button at the bottom and paste in HTML code directly. Click on the Page Footer tab to add identity information about your organization, such as your address, phone number and social media accounts in the footer. Click Save for changes to this specific page of your form or Save to ALL Pages if you want to apply it to every page. See all the options available for your online form’s headers and footers in Editing the Header and Footer of a Page. Watch this video to see how easy it is to customize your online forms. Our DonorPerfect Online Forms Styler helps you customize your online forms to match the look and feel of your organization’s branding and website. Easily adjust the background, fonts, borders, titles, buttons and more on your forms without having to write any code. Edit your form and click The Basics > Style Your Form. Click on the Launch Form Styler button. Select a ‘Style Theme’ and ‘Color Theme’ in the Base Options section. This allows you to choose the overall look and feel of your form. The Custom Options section allows you to fine-tune the look of your form by formatting specific elements of the form, such as the background colors, fonts, borders and buttons. You can view the results of your selections in the Preview area. When finished, click the Save and Close button. The selections you made in the Form Styler will automatically be applied to the CSS Style Sheet for your form and saved. Need advanced editing options for your forms? Check out Editing, Saving and Restoring the Cascading Style Sheet (CSS) in the Knowledgebase. Or contact your account manager to have our in-house professional design/consultation service do the work for you. Create a link to your form to include in your website, email messages and on social media using the Create Form Links item off of The Basics menu when your form is in edit mode. Use that link to promote your form. Learn how in the Promote Your Cause section of this resource guide.